Our next Spotlight Mom this week is Andrea Thomas of Short Stacks and the ScratchMeNot Flip Mitten. I stumbled across her website while looking for mittens for Arabella, that would stay on. I can't get over how quickly babies fingernails grow. It seems like every other day I am trimming my daughters' nails. And, when I miss a day, I find that Arabella mainly managed to scratch her face. 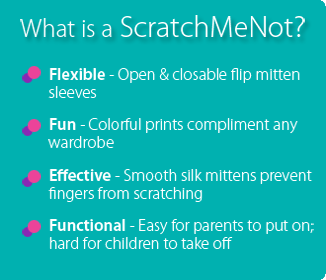 So, when I saw Andrea had created ScratchMeNot flip mittens, I couldn't' wait to try them out and see if they would help Arabella when she scratches, as well as share her story with you. "ScratchMeNots provide a simple solution for those little one who scratch. Whether it's random, or for those with skin irritants, such as eczema or chicken pox, ScratchMeNots prevent skin damage. The unique flip mitten sleeves are designed with the added flexibility to be worn all day or whenever scratching is most prevalent." When I reached out to Andrea, she was excited to participate in my Spotlight Mommy feature, and kindly sent along a sample of her flip mitten for me to review. I will be sharing more about her product on Friday, in my Feature Friday product review post. But, in the meantime, please enjoy my Spotlight Interview with Andrea Thomas of Short Stacks. Favorite Book: I don’t have a favorite at the moment…so for now, I’ll go with the Harry Potter series. I really enjoyed them, felt like a kid at a library all over again. Tell us a little bit about yourself. How many children do you have? What are their ages? I’m a mom that loves family, friends and the work I do to help babies and tots! I have a very supportive husband and 2 kids that keep me on my toes and up all night :) Both of which are energetic and full of life! I absolutely love dessert and wish sugar was as healthy as carrots. (My children do, too) I enjoy cooking with the family and pretending to work out. Vacation, family time, the Olympics, funny movies, independent films and dessert! I started a company called, Short Stacks, and created the ScratchMeNot Flip Mitten. It’s a flip mitten sleeve that prevents child from 0-3+ years from damaging their skin due to scratching. Easy for parents to put on, hard for children to take off. It also helps with thumb-sucking. Around age 2 months, my daughter started getting a rash that she occasionally scratched. The scratching increased and rash popped up all over her body. It turned out that she had eczema and her scratching was almost non-stop. I knew the traditional baby mittens we got as gifts were not going to stay on, she wiggled out of those as a newborn. I searched for an alternative. Everything I tried failed, from mittens to socks. I even tried winter gloves. By 5 months, she had mastered taking everything off her hands quickly. Seeing my little Houdini at work, I decided to see if I could make one myself. The first pair of mittens I sewed by hand and I knew I was on to something. When the first ScratchMeNot was complete, I tried it on my daughter. Not only did it stay on, she couldn’t damaging her skin if she tried scratched. I didn’t have to worry about taking the entire mitten on and off. If she wasn’t scratching, I could easily open them up and close them once scratching began. The silk outer layer of the mitten glided over her skin without causing skin abrasion. I knew if I was a mom that was up day and night with a scratching child, there were many other parents battling the same thing who need a product that really works. 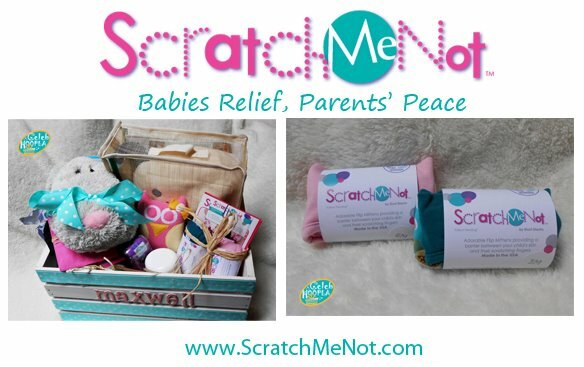 Using the ScratchMeNot, gave me a peace of mind that I want to share with other families. It also gave me an opportunity to stop focusing on the scratching long enough to figure out what was triggering her eczema. For us, it turned out to be food sensitivities/allergies. I like to call it controlled chaos! I create a schedule or a ‘To Do’ list the day before and try to tackle as much as possible. I know my work day is going to be unconventional. I have small kids, which means a small window for work. My true office hours are between 9:30am – 1:30pm. It picks up again during nap, after the family goes to sleep until about midnight or 1am. Of course, I may slide in some extra time, but the goal is to allow my kids to see me working but not allowing work to become more important that them. When I started the company, I had no idea how big of an undertaking it was. There’s so much involved with running a successful business and many decisions to be made. I wanted to spend day and night working because I enjoyed it and wanted to see it succeed. However this can quickly take a turn towards becoming a workaholic. I still struggle with the balance. Thankfully my husband challenges me to focus on our ultimate goal and plan accordingly. It’s great to be married to a planner! I was an architect. I enjoyed it and looked forward to growing within the career. However, when I started my own company, I didn’t realize how addictive it would be! I LOVE what I do. Helping parents and children is so rewarding. Helping families understand itchy skin and scratching! Also seeing results from using their flip mittens and how happy it has made the parents. Hearing the relief in parents’ voices and through their testimonials. And of course, my family! Having children is life changing and a roller coaster ride that doesn’t quite end. Understanding that I cannot do it all. Especially, in one day! It was overwhelming to see so many successful businesses when I first started. I wanted to arrive already. It sounds cliché, but there aren’t many shortcuts, just great ideas and making even better decisions. My motivation? Knowing that the work I do makes a difference. I get a chance to help those with the smallest voice, little kids :) How awesome is that?! Remembering family time trumps work. Since I love what I do, I want to do it ALL of the time. Yet, I must stick to a schedule which really helps me stay balanced. One of the joys of being a mom is the opportunity to teach my children about life and play along the way. I try to remember these young years won’t last long. Work will always be there. Continuing our efforts to reach as many families as we can. We want to give babies relief and parents peace. Make sure you have a plan. Before starting a business (even after you’ve started), create a detailed business plan. Include a budget and time management. The more prepared you are, the better your company will thrive! I cannot stress enough that a business plan really helps you have a business path. It helps you map out where you want to be and how you plan to get there. Realizing the plan may change, yet having a starting point helps when it’s on paper. I think it becomes more real and the goals become more tangible.